I suppose I should say “spoiler alert,” but if you haven’t seen Star Wars: The Last Jedi by now, I think it’s safe to say that you don’t have a lot of interest in it and don’t much care if I spoil it for you. 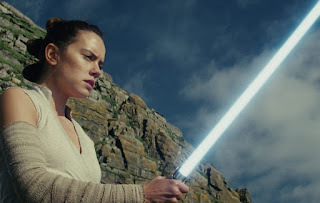 Rey, the character introduced in the previous Star Wars film, The Force Awakens, has been the subject of two years of fan theories, mainly because The Force Awakens left a huge hole where her backstory should have been. All we knew about her history was that she was left by her parents to fend for herself on a remote planet for something like twenty years. There were all kinds of intriguing hints as to who her parents might be. Fans theorized that she was everyone from Luke Skywalker’s daughter to the reincarnation of Darth Vader (and everyone in between). The more outlandish the theory, the more it seemed to catch on. So many fans hated that big reveal. Hated it. (I loved it.) They wanted her to be somebody. They wanted an easy explanation for her power. They wanted their theories confirmed. More than that, they wanted it confirmed that greatness could spend 20 years toiling in absolute obscurity. Maybe we like the idea, more than we would even want to admit, that people can be important and significant, even if nobody knows it. Actually, though, that’s what the movie’s saying. It just doesn’t want us to make the mistake of thinking that greatness comes from your bloodline, your inheritance, from the privilege you enjoy or the DNA you’ve been given. Rey is, apparently, chosen by the Force. That’s why she’s special. Who her parents were has nothing to do with it. By listening to and following her calling, she makes a difference in spite of the fact that she’s nobody. We live in a world where, to successfully run for public office, you have to be able to get your hands on large sums of money. You have to be wealthy, or know a lot of people who are. Leaders in business and finance are generally from important families and have the connections to get into exclusive schools and run in exclusive circles. Sure, nobodies from nowhere sometimes make good through exceptional talent and hard work, but that’s the exception and not the rule in our world. That was even more true in Paul’s world than in ours. In his world, it was almost impossible to escape your social class. And that’s why the gospel was so earth-shaking and revolutionary. Imagine a plebeian in Rome or a member of the Dalit caste in India hearing these words: “God chose the foolish things of the world to shame the wise; God chose the weak things of the world to shame the strong. God chose the lowly things of this world and the despised things—and the things that are not —to nullify the things that are, so that no one may boast before him.” Imagine a kid in American’s inner city hearing them, surrounded by poverty and crime, decaying property and hopelessness. Imagine a young girl in Appalachia, or an old woman alone in a nursing home hearing those words. The foolish things, the weak things, the lowly things, the despised things, the things that are not — there are a lot of people in our world who know those terms well. The aged. The infirm. The mentally ill. The socially awkward. The deformed. The unattractive. The depressed. Those who have been marginalized for their gender or race. They can identify with every category Paul mentions. And if the church would only preach the gospel like this, we might just change the world. People who everyone else dismisses or ignores just might start to believe that God loves them and can do great, significant things in the world with them. If only. In that scene in The Last Jedi, when Kylo tells Rey who she is — and who she’s not — he doesn’t stop there. “You’re nobody,” he tells her, but it isn’t in a sneering, villainous way. Kylo wants Rey to join him, see. He doesn’t care that she isn’t seemingly important, that she doesn’t have a name or a bloodline. “You’re nobody,” he tells her. “But not to me.” And he holds out his hand. It has to be tempting. For someone to know you don’t matter, you’re not important, you’re nobody…and they want you anyway, they love you anyway — man, that’s compelling. You don’t have to pretend with someone like that. You don’t have to be someone you aren’t. But see, that’s the gospel: God chose what the world dismisses and devalues. When Jesus was made human, it was as a nobody. The people in charge of the world around him would have said he didn’t matter. He collected the ignored and despised around him as followers. He spent most of his time with the dregs of society. He died as the worst of the worst would have died, in the worst of the worst of all the ways possible to die. When God raised him from the dead, it was with the promise that anyone who put their trust in him could share in his new life. Even the nobodies. Especially the nobodies, because how better to prove that God takes what the world doesn’t know better than to discard and does beautiful things? But the church too easily forgets this. We market ourselves as successful, hip, and slick. We trot out the best and the brightest as leaders. Our websites feature smiling, happy, people who seem to have it all together. And we send the message that it’s those folks we want. But those folks don’t want us, by and large. Jesus said they wouldn’t. They have too many other options. But those nobodies — they need to know that God values and loves them just as they are. And how better to show it than for us to own the truth: most of us are nobodies, and that’s just as it should be. And even those few of us who might be somebodies will choose to be nobody here. And instead of praising ourselves we’ll praise our Lord. And instead of recruiting the successful so we’ll feel better about ourselves we’ll proclaim to the other nobodies that they’re somebody to him. And to us. God does beautiful things in the world with nobodies. He always has. May we embrace who we are so that we can embrace who he makes us. And so we can embrace the other nobodies who he might call.